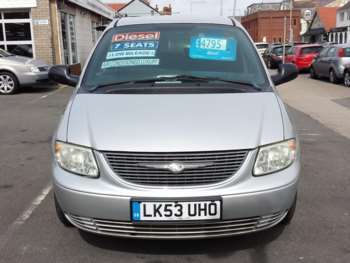 The Chrysler Voyager first arrived in the UK in March 1997 and was available either with a 2.0-litre four-cylinder engine or 3.3-litre six-cylinder engine. The V6 came with an automatic gearbox and the four-cylinder version with a manual 5-speed transmission. In 1998, 2.5-litre diesel versions were added to the range. In 2001, the range was revised thoroughly, not particularly in terms of its looks, which remained largely the same, but major changes were made under the bonnet. Two petrol options were provided, a 2.4-litre four-cylinder engine and a 3.3-litre V6. The most significant second-generation model has been the 2.5-litre turbodiesel due to its superior fuel economy. All versions of the Voyager are extremely well equipped, with even the base models featuring remote central locking, anti-lock brakes, dual airbags, air conditioning, electric mirrors and windows, immobiliser and RDS stereo. The higher, LE trim also boasted power-adjusted driver's seat, cruise control, adjustable steering column, roof rack, alloy wheels and front fog lights. Apart from the entry-level SE first-generation variants, all used Voyager cars have seven seats. There are two individual seats in the front two rows and a three-seat bench at the back. The seats can all be reversed, folded or removed, making it an incredibly versatile second-hand buy. A used Chrysler Voyager is a prestige vehicle with a very reliable record and a massive amount of storage space. However, it’s not the cheapest car in its class. The first-generation 2-litre model copes well with the bulk of the Voyager, and when used wisely its economy is not too bad. The same cannot be said of the thirsty 3.3-litre version. For a car of this size, it handles pretty well, though its pulling power can result in overuse of the clunky manual gearbox. The automatic transmission performs much better.